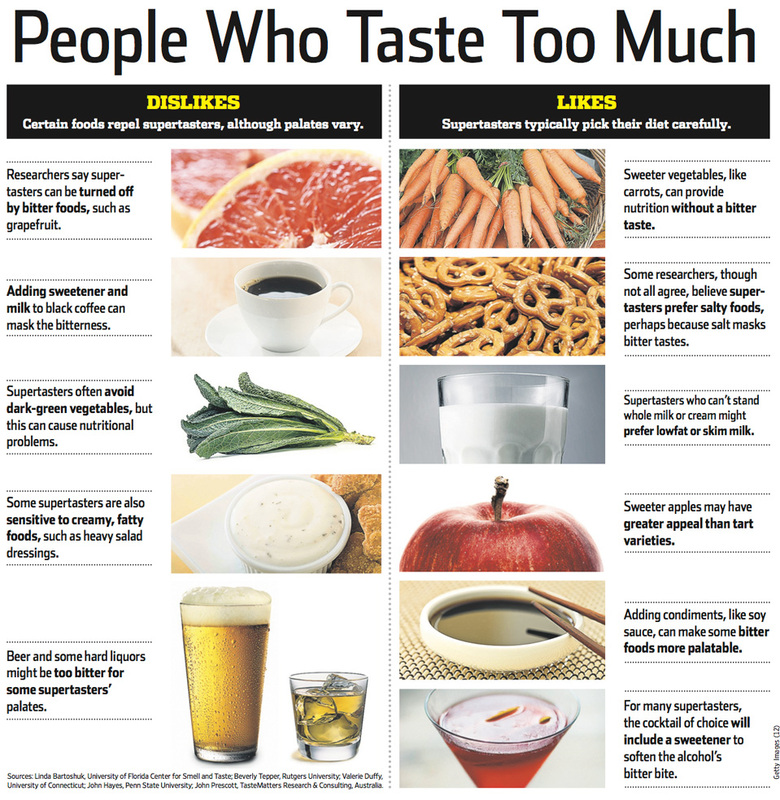 Coined in the 1990’s by Yale Professor Linda Bartoshuk, a ‘supertaster’ refers to an individual with a particularly heightened sense of taste perception, characterised by a greater number of taste buds than their sensory-challenged ‘non-taster’ counterparts. The interest was first sparked in Bartoshuk when she observed that the artificial sweetener saccharin evoked an unpleasant bitter aftertaste in some, but that was unnoticeable to others. We’ve known for some time that everybody’s sense of taste differs, both in preference for particular foods and in perception itself, however we now also know that testing an individuals strength of taste may be as simple as looking in the mirror. By applying some blue food dye to the tongue, and sectioning off a small circle using a hole-punched piece of paper, tiny taste buds are made visible. Simply count the number of visible taste buds within the circle, and if you record more than 30, you are a supertaster! An older, yet fascinating test to discern ‘supertasters’ involves taking a small piece of paper that has been dipped in propylthiouracil (PROP) and placing it on the tongue. This chemical – historically used to treat hyperthyroidism – will separate the non-tasters from the supertasters. Personally, I can vouch for both of these tests. In one of my obligatory ‘sensory’ units circa first year uni, my class tested the PROP exercise. A huge divide swept over the room, as some could taste nothing but paper, some a slight bitterness, and the rest – an unbearable, disgusting, cringe-worthy taste. Unfortunately for me, I was in the latter group – and sure enough, my tastebuds reflected this. So what does it mean to be a supertaster? Being particularly sensitive to taste may mean foods with a bitter flavour are perceived as very strong, even unpleasant. For example, vegetables such as cabbage, Brussels sprouts and broccoli, and drinks like coffee, green tea, grapefruit juice and tonic water may be unappealing or difficult to tolerate. Often the reaction to hot or spicy foods is heightened in supertasters; fat is perceived as creamier, sugar sweeter, but salt – very much accepted. Research conducted by Bartoshuk sought to decipher whether the difference in taste perception could be linked with health status, working form the premise that taste determines dietary choices, and that dietary choices can be a risk factor for disease. Supertasters, it was found, are more predisposed to health risks due to a greater dislike for flavanoid-containing fruit and vegetables (which are known to protect against cancer, in particular). Conversely, supertasters may be less likely to consume fatty or sugary foods due to the amplification of their taste perception, meaning that their body weight is likely to be lower, thus implying a lower risk for cardiovascular disease. Another plus for the supertaster is that addictions like tobacco and alcohol are less likely, due once again to their strong and often bitter taste. These relatively new findings have many intrigued, and not just those in the nutrition industry. Our food system is ever changing, with the supermarket shelves bursting with newly developed products and line-extensions. With a great demand for healthier products – generally lower in fat and sugar – food producers must find the balance between maintaining sensory satisfaction and increasing nutritional value. Supertasters can pose a problem here, as often fat and sugar replacers (artificial sweeteners particularly) may lend themselves to a bitter taste that goes undetected in non-tasters. This is where the food scientists come in – developing new techniques and ingredients to cater to those of all tastes. Think your taste is pretty strong? It very well could be, as it’s estimated that around 15-25% of people are, with a higher proportion of women than men identified as supertasters. 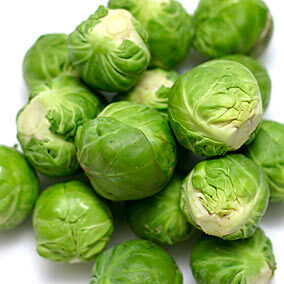 So perhaps that’s a good enough excuse to pass on the Brussels sprouts!